Explore Cuba on this unforgettable trip! Shrouded in mystery for the past 50 years, the island nation of Cuba is waiting to be rediscovered. Highlights include overnights in Cuba’s lush tobacco region, the beautiful beach resort area of Varadero, and Cuba’s bustling capital city of Havana. Interactions include a dance lesson; discussion with workers at a traditional print shop; visit to Xanadu, built by American millionaire Irenee du Pont; architectural discussion during a guided walk of Old Havana; meeting with community members of Santo Angel neighborhood; visit to a daycare center to meet the children and the nuns who run the center; visit to the studio of artist José Fuster, known as the “Picasso of the Caribbean”; time at a tobacco farm to enjoy coffee with the owner and his family; and engaging with children at an acrobatics school. Dinners at local paladars (small, privately owned restaurants) and lunch at an organic urban farm are just a few of the tantalizing special dining experiences. All people-to-people interactions weave seamlessly into the daily visits around the country, serving to enrich and enlighten. You’ll come away with a deep understanding of Cuba and its people on this once-in-a-lifetime travel experience! Arrive in Miami and transfer to your hotel. Tonight, meet your Cosmos Group Leader for a 6 pm welcome meeting. This is a good time to meet your fellow program participants and get last-minute questions answered. A short flight brings you to Havana, where you’ll meet your Cuban National Tour Director. Travel through Cuba’s countryside, stopping at Bacunayagua Bridge, the tallest bridge in Cuba. Enjoy incredible views and time for pictures at this spectacular lookout point. Arrive at your beautiful waterside resort for a 2-night stay. Enjoy an interactive DANCE LESSON before dinner tonight. This morning, visit Matanzas, known as the “Athens of Cuba” for the many renowned artists and intellectuals it has produced. Visit TRIOLET PHARMACY, which dates back to 1879 and is preserved in its entirety. Then, interact with workers at EDICIONES VIGIA, a print and binding shop, and learn about the traditional craft that is still done by hand. This afternoon brings us to Cárdenas, where we’ll visit with several ARTISTS and learn about their works and inspirations. Before returning to your hotel, stop at CASA DUPONT, built in 1926 by American millionaire Irénée du Pont. See the lavish grounds, and admire the detailed architecture of this former mansion, nicknamed “Xanadu” by its owner. This morning, travel to Havana, the bustling capital of Cuba and your home for the next two nights. Start your time in Havana with a visit to a local ORGANIC FARM, where you’ll join a discussion with the workers. Enjoy lunch at the farm’s paladar (a special, privately owned restaurant). Over dessert, discuss with the owner and staff their farm-to-table process and the free enterprise system in Cuba. Then, visit a DAYCARE CENTER to interact with the children and the nuns who run the program. The children may even delight you with a song or two. Next, visit FINCA VIGIA, Ernest Hemingway’s beloved home. Hemingway lived in Cuba for 30 years and is well respected by the Cuban people. Also see his fishing boat, El Pilar, used to patrol for German U-boats during WWII. Tonight, enjoy dinner at El Aljibe Restaurant, famous for its open-air ambiance and special slow-roasted chicken. Start the day with a panoramic tour around Havana that includes REVOLUTION SQUARE, the University of Havana, the Capitol Building, and Prado. Next, join a local ARCHITECT for a walk in Old Havana, a UNESCO World Heritage Site. Discuss the different types of architecture found throughout the city, the progress of restoration projects, and how they receive their supplies and funding. Afterward, visit the SANTO ANGEL NEIGHBORHOOD to interact with local community members. You’ll learn how their project was founded to better the neighborhood by offering services such as a beauty school, cafeteria for the elderly, and art galleries. We’ll end the day with a stop at the FERIA DE ARTESANIA to meet local artists and see the wares sold at this area market. Today we travel to the western end of the island to the province of Pinar del Río. With some of the country’s most beautiful scenery, you’ll see lush emerald-green tobacco fields and dramatic limestone formations, called mogotes, which are the height of skyscrapers and tower over the Viñales Valley floor. Visit a a local school and interact with the teachers and staff. Enjoy a guided NATURE WALK to learn about and discuss some of the unique flora and fauna found in this region of Cuba. Upon arrival in Viñales, your Tour Director will take you on a walk through the handsome square and along the wide main street lined with turn-of-the-century cottages with red-tiled roofs. During your walk, share in a discussion with the people who call this part of the world home. Spend the next two nights at a Casa Particular (a privately owned bed & breakfast). Here is the unique opportunity to interact with a local family and immerse yourself in the Cuban culture. Before you know it, you’ll be part of the family and will be made to feel very special. Since we are in the heart of Cuba’s tobacco region, we’ll visit a CIGAR FACTORY and interact with tobacco rollers. Learn about the importance of tobacco, both culturally and commercially, for Cuba. Afterward, we visit a local COMMUNITY ART PROJECT and have a discussion about their program that helps children with Down Syndrome. Lunch will be served at a local farm, where you will have the opportunity to chat with the staff and owners. This afternoon, meet a local farmer and his family at a TOBACCO FARM. Learn about the process of growing, drying, and rolling tobacco. You can even try rolling a cigar yourself! Take some time to get acquainted with the owner and his family over coffee. Return to bustling Havana and visit artist JOSÉ FUSTER’S STUDIO, cleverly nicknamed the “Picasso of the Caribbean.” Here, you’ll discover a surreal world—like nothing you have seen before. Interact with members of the neighborhood to discuss the project’s impact on the surrounding area. This afternoon’s highlight includes a workshop at the ANGELES DEL FUTURO Community Project, where you’ll meet young children learning acrobatics and circus skills. You’ll be amazed at their talents and impressed with the skills they have mastered at such a young age—definitely a trip highlight! Before dinner this evening, meet members of the local Old Styler Car Club. Hear why Havana’s streets are filled with vintage American automobiles, and converse about how these cars are obtained and what it takes to keep them running. Ride in an OLD STYLER CAR to your farewell dinner, the perfect ending to your time in Cuba. After breakfast, depart for the airport and your return flight to Miami. Please schedule connecting flights after 6:50 pm. 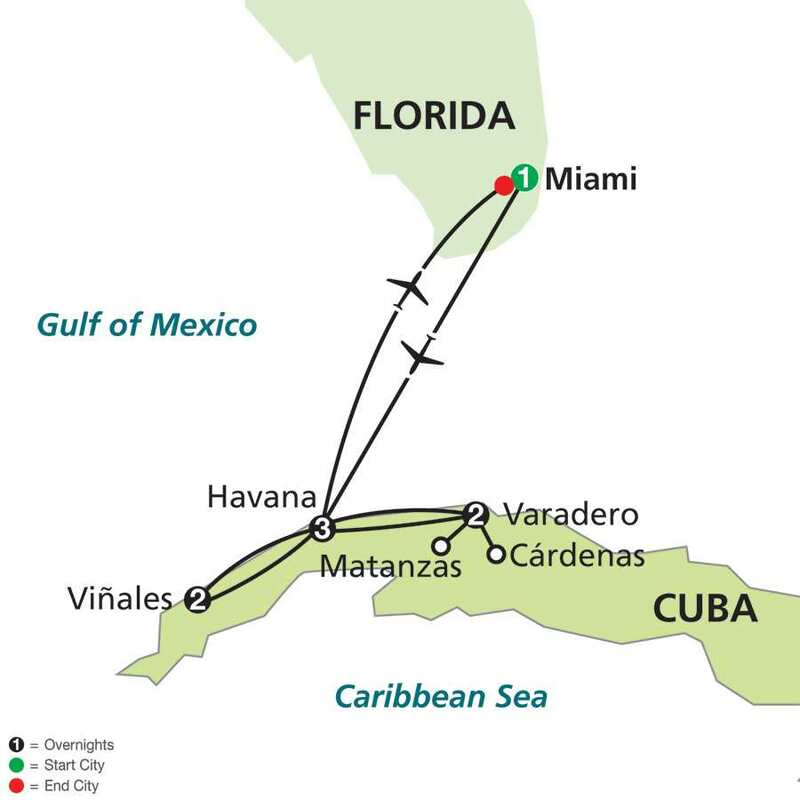 Due to special requirements to visit Cuba, participants will be required to complete visa application ($80 visa fee is additional and mandatory) and travel reservation forms, and sign an affidavit confirming that they are traveling under a people-to-people license and are aware of the travel rules. Participants are also required to send a copy of their passport photo page. These items must be sent to Globus within 7 days of making a reservation. In Cuba, activities that have been scheduled far in advance can sometimes become unavailable for a number of different reasons. The purpose of the trip is to have meaningful interactions with the locals and if the planned people-to-people educational exchange isn’t available, rest assured that another will be substituted that will be just as enriching. Find the vacation dates that work for you, click “Reserve Now” for a vacation quote. You’ll be able to select the number of people traveling, add Travel Protection, and also get an air-inclusive vacation price. You’ll find we offer competitive and hassle-free air-inclusive vacations where you receive free airport transfers and flights coordinated with vacation dates. The price listed does not include your airfare. Contact us to receive an air quote. Popular Departure – due to itinerary and time of year, this departure historically sells out quickly. Early booking is encouraged.